When you shop for a phone it’s easy to get dazzled by curved glass or swayed by the big brand logos that’ll make friends jealous. But perhaps it’s better to look a little deeper and shop based on the tech, rather than the surface shine. There are loads of phone features out there that separate the most important phones from the ones that sell simply because there’s a giant billboard of them plastered on every spare wall in every major city. We’re going to run down 10 of these big-hitter features, including reader favourites like the iPhone 7 Plus’s clever ‘zoom’ camera and high-grade water resistance that doesn’t demand you put a rubber flap back in place whenever you unplug your headphones. Computational photography (improved snaps through clever robot smarts) is the big bright hope for the future of mobile photos, and it’s already responsible for much of the image quality improvement we see in this year’s phones. However, you can’t ignore the principles of photography, something Apple showed in its iPhone 7 Plus. This phone was the first phone to use a 2x ‘zoom’ secondary prime lens to provide ‘lossless’ zoom without adding bulk to the phone. We’ve seen experiments with zoom lenses in phones since the mid-2000s, but Apple showed the way forward is to merge classic camera hardware with smart software to get great results with no compromise in design. Because no-one wants a fat phone, it seems. In the next few years we’ll see developments that will make the iPhone 7 Plus’s second camera look prehistoric, but finally being able to use the camera zoom guilt-free was a big shift. Because as every camera snob knows: digital zoom is bad. If a high-end phone doesn’t have fast charging these days, the manufacturer has made a big mistake. However, OnePlus 5’s Dash charger deserves a special mention because it takes a slightly different approach. To increase the amount of juice a phone gets, it either needs to be supplied with higher voltage or current than the standard 5V and 1/2 amps. Where most solutions choose to ramp-up the voltage and leave current fairly low, the Dash charger keeps the voltage at 5V but doubles current to four amps. This tends to keep temperatures a bit lower, although does rely on you using the supplied cable. Like rivals such as the Galaxy S8’s Qualcomm QuickCharge 3-based plug, you’ll get over 50 per cent charge in half an hour. We may not have week-long battery life yet, but at least batteries don’t take a week to charge either. One of 2017’s quiet innovations was the release of phones capable of Gigabit mobile internet speeds. That’s hardware with a theoretical maximum download speed of 1000Mbps, or 125MB/s. This is thanks to Qualcomm and its X16 modem, which you’ll find in phones like the HTC U11, Samsung Galaxy S8 and Sony Xperia XZ Premium. These phones can download at speeds that outpace the write pace of some mobiles’ internal storage, which is pretty amazing. This is an important milestone on the road to 5G, which we’ve been talking about for years, but is still a way off. It’s now up to mobile networks to start providing 4G services that get remotely close to exploiting this hardware. In the US, AT&T, T-Mobile and Sprint have all talked big about getting Gigabit speeds to some customers in 2017, while in the UK EE achieved real-world mobile internet speeds of 429Mbps in Cardiff thanks to newly-upgraded infrastructure. Phones are quickly catching up with slim and light laptops in terms of the power they wield, and they’ve quietly caught up on storage too. The iPhone 7 and 7 Plus are available with up to 256GB storage, matching the amount you get with a £1000/$1000-plus portable laptop. When so many of us use Spotify for our music and Netflix or YouTube for a roving video fix, perhaps it’s overkill, but it is innovation that offers a real benefit if you want peace of mind when downloading apps, saving photos or even just saving Spotify for offline listening. Where a laptop will use an SSD for this sort of storage, phones use tiny NAND chips smaller than a memory card. The chips needed to fit this much storage in a phone were only released in 2016, made by companies including SanDisk and Samsung. The speed of top-end chips like this also matches a (lower) mid-range SSD, with read speeds 850MB/s, showing just how far miniaturisation has come. When dual camera phones reappeared in 2013, they were quickly dismissed as a bit of a gimmick. You’d use them to fake the bokeh blurring effect you can normally only get with a wide aperture camera lens. While good phones have extremely low f-stop (also known as aperture) ratings, which would usually indicate a very wide aperture in a traditional camera, phones also have very small lenses and small sensors. For the first few years, the effect you’d get was so flawed as to appear, quite often, comically bad. Now, with higher-quality dual-lens cameras and much better processing, the top performers like the Huawei P10 and iPhone 7 Plus can create algorithm-based shallow depth-of-field pics that can (for the most part) be blown up as adverts in subway stations. Apple did this in 2017 and 2016. This choice may be a little contentious as, to a trained eye, the effect still isn’t anywhere near as natural as a good DSLR or compact system camera with a lens offering equivalent aperture. However, several times we’ve had to do a double-take after seeing a bokeh-effect phone photo posted by a friend or colleague on Facebook, assuming they’d been taken with a dedicated camera, thanks to the improvement in the effect. If you want the best home virtual reality experience available, you’ll want a HTC Vive. But better be prepared to spend a fair amount on the headset hardware and then twice that on a PC with the chops to make the most of it. Bank account not ready for that beating? The best phones now have displays that compare well with the top VR headsets. The Samsung Galaxy S8’s 2960 x 1440 pixel screen is actually significantly higher-res than the HTC Vive’s 2160 x 1200 panel, and Samsung’s latest Gear VR headset increases field of view to 101 degrees for a more immersive experience. Yes, the games available on Vive are much better, as is the 110-degree field of view. However, you can play many games (and apps) with the Gear VR headset and both Samsung and Google make a proper VR controller that makes worthwhile VR experiences much more viable. Oh, and you can play Minecraft already. Case closed. A few years ago ‘full’ water resistance started appearing in high-end phones, letting you dunk them in water withou followed by tears and an expensive purchase of a new phone. But those phones needed rubber bungs over every port. Newer water resistant phones look and feel just like normal models, because their headphone jacks and ports keep liquid out by design. But those phones needed rubber bungs over every port, making them annoying to us and issue Sony often struggled with. water resistant phones look and feel just like normal models, because their headphone jacks and ports keep liquid out by design. t by design. The LG G6 is, like the Samsung Galaxy S8 family, certified to the IP68 standard. This means it can be submerged in water at a depth of up to 1.5m for 30 minutes without letting any water in. Until this year, most water resistant phones had IP67 chops, max, meaning they can take depths of up to 1m. We’re still a way off phones that can reliably handle the added pressure and water additives of swimming and diving. But even being able to use your phone to listen to a podcast or some tunes while in the shower is a win in our book. The next revolution in mobile phones is something you may not have thought much about yet in phone terms: augmented reality (AR). Asus’s Zenfone AR is one of the first mobiles to feature the hardware required for next-level AR that makes Pokemon Go look like a weak tech demo. It has three sensors on the back: a standard one as found on most devices, an IR depth sensor and a third camera used to track the motion of objects. With a Google Project Tango-compliant app, this setup lets you fully 3D-map rooms in your house so you can walk around them freely, the app knowing where you are. The effect is similar to HTC Vive room tracking, which needs a pair of cameras on tripods for the same effect and certainly isn’t lounge-friendly. It can be used to help you redesign your house, see complex data laid out in 3D and, best of the lot, turn your flat or house into a game world. Get ready, because we’re about to be flooded with AR phones… especially as the iPhone 8 is set to herald a real move into AR for Apple. Modular phones have appeared and disappeared like the picture on an analogue TV. Project Ara (remember the ‘build your own smartphone’ pledge?)? Scrapped in 2016. Fonkraft appeared on crowdfunding site Indiegogo before being pulled for, presumably, looking too much like vapourware. LG’s modular efforts seemed to start and finish with the LG G5. 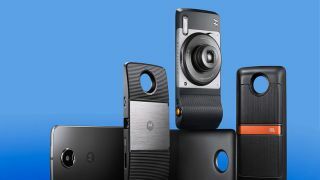 Motorola’s, and now Lenovo’s, Moto Mods project is the only one that has doggedly ploughed through the raised eyebrows and low sales to carry on to today. Lenovo has announced the Moto Z2 Force and reaffirmed its belief in phone modules - and it seems others will follow suit, with the newly-launched Essential Phone packing pogo pins to attach accessories. For Moto, there’s a speaker, a gamepad, a battery case, a Hasselblad camera mod and, most interesting of the lot, a 360-degree camera. While you can’t break a phone down to its components, like in the Project Ara dream, it does turn the Moto Z2 Force into the phone equivalent of Batman’s utility belt. Ever watched The Slo Mo Guys YouTube channel? If you haven’t, you should check it out. Their slo-mo videos turn exploding water balloons into a ballet of movement, giving you an unusual insight into physics you just can’t appreciate with the naked eye. They use cameras that cost upwards of $150,000, but you can now get your own pocket take on the idea with the Sony Xperia XZ Premium. The phone can shoot video at 960FPS, which captures 40 times more frames per second than standard cinema 24fps. The result is eerily slowed-down footage. You won’t want to shoot your friends walking down the street with this mode, but capture the water flowing down a fountain and it’ll look great as you uncover the secrets of seemingly-mundane things with slowed-down footage. That we can get this sort of tech in a normal phone is quite amazing, even if we’re gagging for outputted footage that’s higher-res than the current upscaled 720p. We’re at the start with this one, but with Samsung having developed a sensor that can do the same thing, it’s a trick that’s going to repeated regularly in the future.